In a Wall Street Journal interview, Los Angeles Times owner Patrick Soon-Shiong reveals he wants to reach 5 million digital subscribers. That's equal to The New York Times and The Wall Street Journal’s digital subscribers combined. The New York Times had 3.4 million digital subscribers by the end of 2018, three times what it had three years ago. The Wall Street Journal had 1.71 million digital subscribers, more than double what it had at the end of 2015, according to the business publication. The New York Times has also set a high target: 10 million digital subscribers by 2025. Since the biotech billionaire purchased the Los Angeles Times from Tribune Publishing in June 2018 for $500 million, the newspaper has doubled its subscriber number to 150,000, an impressive feat but far from the millions. Publishers are increasingly building out their subscription businesses to make up for lost ad revenue scooped up by tech giants like Google and Facebook. Vox Media, which ownsVox, The Verge, SB Nation, Eater, Curbed and Recode, will introduce paid membership tiers later this year, for example. Condé Nast announced a few months ago it would put all of its titles behind paywalls by the end of 2019 (The New Yorker, Vanity Fair and Wired already have paywalls). Though Soon-Shiong did not tell The Wall Street Journal in the interview when he hopes to hit the 5 million mark, he made it clear it was a goal to ensure the success of the company. Soon-Shiong said he is focused on California’s 40 million residents, rather than trying to compete for a national audience. 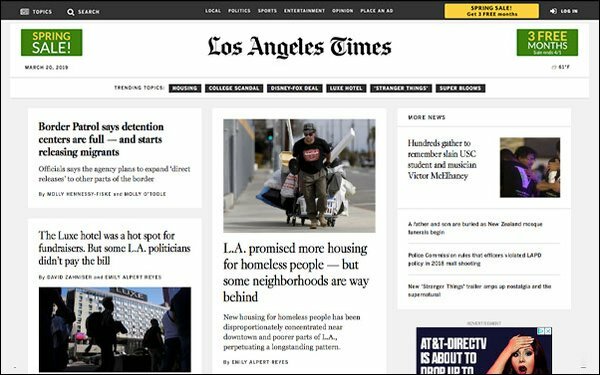 He is looking to expand the L.A. Times’ reach closer to its home base: into nearby states, Mexico, western Canada and other countries surrounding the Pacific Ocean, he told WSJ. Soon-Shiong has already invested an additional $150 million into the company since he bought it last summer. The deal also included the San Diego Union-Tribune, as well as a number of other Southern California newspapers. Since the acquisition, the LAT has made over 100 hires and moved to new headquarters in El Segundo.